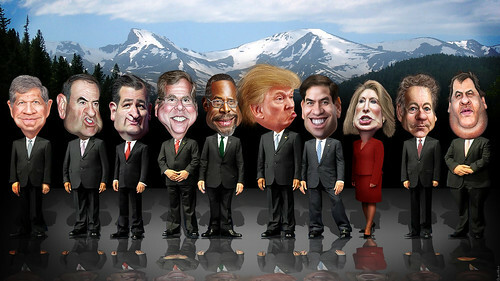 CNBC Republican Debate Lineup - October 28, 2015 in Boulder, Colorado. Will it be: Bedlam in Boulder, Bickering in Bolder, Bloodsport in Boulder, Blowhards in Boulder, Bologna in Boulder, Bombast in Boulder, Boredom in Boulder or A Bruising in Boulder? This caricature of Rand Paul was adapted from a Creative Commons licensed photo from Gage Skidmores's Flickr photostream. This caricature of Mike Huckabee was adapted from a Creative Commons licensed photo from IowaPolitics Flickr photostream. This caricature of Chris Christie was adapted from a photo in the public domain from FEMA. This caricature of John Kasich of Ohio was adapted from a photo in the public domain available via Wikipedia. This caricature of Carly Fiorina was adapted from a Creative Commons licensed photo from Gage Skidmore's Flickr photosteam. This caricature of former Florida Governor Jeb Bush is a Creative Commons licensed photo from the The World Affairs Council's Flickr photostream. This caricature of Marco Rubio was adapted from a photo in the public domain from the United States Senate website. The bodies in this image are adapted from a Creative Commons licensed image by Presidencia de la Nación Argentin available via Wikimedia and a photo in the public domain from the U.S. Dept. of State. The background was adapted from a photo in the public domain available via Wikimedia.